From the usual matches , you can make a variety of shapes, from simple small houses to complex and multi-tiered buildings. Most match designs is a simple cube, from which are made all the matchbox houses. 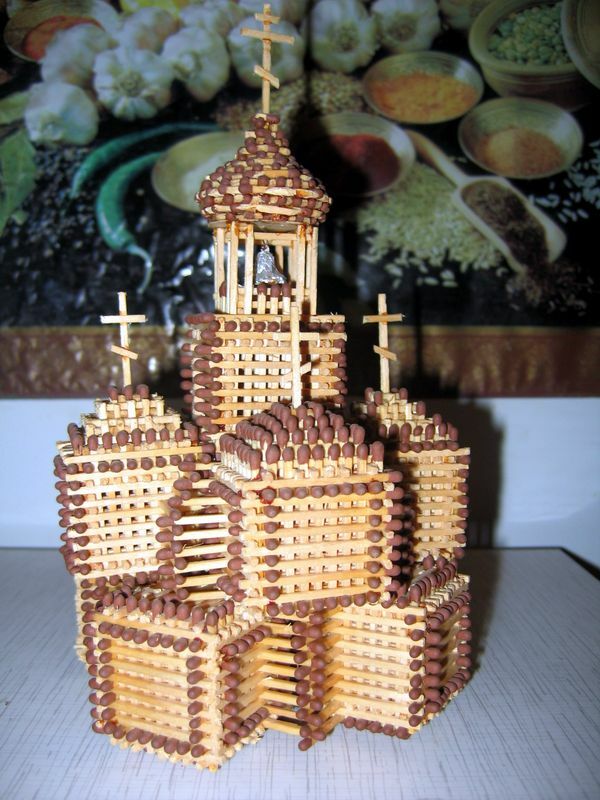 Having mastered the manufacture of such blocks, you will be able to make a Church out of matches, which will decorate your home collection or a great gift for friends. For construction prepare a large number of matchesto make 22 of them die. Technology folding cube is very simple, it does not require glue. Need to take two matches and put them parallel to each other. Perpendicular to the first two lay the six matchsticks to make a square platform. On top of this layer, make another layer of six matches, directing their heads in the opposite direction. Make as many rows match as necessary in order to make a cube. Fabricate twenty two dice of equal size, and in the side wall of each cube then insert a number of matches, setting them along the third row of the wall. Each match break off at a certain length so that the number was increasing. Similarly, lay a match across the cube, placing increasing length. Side match pull up and press them using the already inserted matchesand then start installing the roof. Shrink item and insert the tile. Make four parts with part tiled roof – two have to look in one direction and two in another. Extend the roof and connect them with other parts that do not have tiled roofs. Three cubes of matches connect vertically, using a matchstick, is inserted between the cubes. In the blank insert three cubes connected above, and then shrink the design and finish the roof by installing two dice with the tile. Connect the cubes of the roof with each other and combine them with the main item. Two dice with the roof tiles set just above, connecting them with another cube at the bottom. You should now have the framework of the Church. Two dice with the roof, you will need to build the two towers. With broken heads of matches to make on the towers window. Attach the tower to the walls of the Church, making matches on the sides. Decorate design designs from match heads.